I could not resist sharing this information with you after reading it on the Planet Green website. On average, we waste 14% of our food purchases per year, and the average American family throws out over $600 of fruit per year. 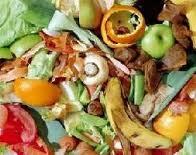 Most of the food we waste is due to spoilage; we're buying too much and using too little of it. We've all had it happen: half the loaf of bread goes stale because no one wants to eat sandwiches today, and the grapes we bought as healthy snacks for the kids' lunches languish in the crisper. With a little creativity, and an eye toward vanquishing waste in our lives, we can make use of more of our food before it goes to waste. Here are a few ideas for you. 1. Leftover mashed potatoes from dinner? Make them into patty shapes the next morning and cook them in butter for a pretty good "mock hash brown." 2. Don't toss those trimmed ends from onions, carrots, celery, or peppers. Store them in your freezer, and once you have a good amount saved up, add them to a large pot with a few cups of water and make homemade vegetable broth. This is also a great use for cabbage cores and corn cobs. 3. Don't toss broccoli stalks. They can be peeled and sliced, then prepared just like broccoli florets. 4. If you have to dice part of an onion or pepper for a recipe, don't waste the rest of it. Chop it up and store it in the freezer for the next time you need diced onion or peppers. 6. If you're preparing squash, don't toss the seeds. Rinse and roast them in the oven, just like you would with pumpkin seeds. The taste is pretty much the same. 7. Celery leaves usually get tossed. There's a lot of good flavor in them; chop them up and add them to meatloaf, soups, or stews. 9. Canning is always a good option. If you're doing tomatoes, you can use a boiling water bath. If you're canning any other type of veggie, a pressure canner is necessary for food safety. 11. Too many zucchini? Make zucchini bread or muffins. If you don't want to eat the bread now, bake it and freeze it, then defrost when you're ready to eat it. 14. Jam is really easy to make, and will keep for up to a year if you process the jars in a hot water bath. If you don't do the water processing part, you can keep the jam in the refrigerator for a month, which is a lot longer than the fruits would have lasted. 17. Make a big fruit salad or "fruit kebabs" for your kids. For some reason, they seem to eat more fruit if it's in these "fancier" forms. 19. Don't throw out those watermelon rinds! Pickled watermelon rind is a pretty tasty treat. 23. Freeze leftover bread. This way you'll have day-old on hand whenever you need bread crumbs, or croutons rather than using fresh bread. 25. A few tablespoons of leftover oatmeal isn't enough for a meal, but it is great sprinkled on top of yogurt. 29. If you our your kids don't like the bread crusts on your sandwiches, save these bits and pieces in the freezer to turn into bread crumbs later. Just throw the crusts into a food processor or coffee grinder to make them into crumbs. Season as you like. 30. If you have just a smidge of baby cereal left in the box, and it's not enough for a full meal, add it to your babies pureed fruit. It adds bulk and fiber, and keeps baby full longer. 31. Don't toss those chicken bones after you eat the chicken. Boil them to make chicken stock. 36. If you've got a few chunks of different types of cheese sitting around after a party, make macaroni and cheese. 44. Dry herbs by hanging them by their stems in a cool, dry location. Once they're dry, remove them from the stems and store them in airtight containers. 46. If there's a splash or two of wine left in the bottle, use it to de-glaze pans to add flavor to whatever you're cooking. 47. If you have pickle juice left in a jar, don't pour it down the drain. Use it to make a fresh batch of refrigerator pickles, or add it to salad dressings (or dirty martinis). 49. If there's just a bit of honey left in the bottom of the jar, add a squeeze or two of lemon juice and swish it around. The lemon juice will loosen up the honey, and you have the perfect addition to a cup of tea. 50. If you can't think of any way to use that food in the kitchen, compost it. Everything except for meat and dairy will work in a compost pile, and at least your extra food can be used for something useful. Such as growing more food!